Με λίγα λόγια: ο στόχος για 3,5 % πρωτογενές πλεόνασμα το 2018 είναι ανέφικτος, ενώ ο εφικτός είναι στο 1,5 % και με επιπλέον δύσκολα μέτρα στο 2,0 %. Αν δεν αναθεωρηθεί ο στόχος αυτός , με ανάλογη ελάφρυνση του χρέους, το ΔΝΤ δεν θα συμμετάσχει στο πρόγραμμα. Έφτασε η ώρα της αλήθειας για Ευρώπη και Ελληνική Κυβέρνηση. Program discussions between Greece and the institutions have made progress in recent weeks, but significant gaps remain to be bridged before an agreement can be reached that would include the IMF under one of our program facilities. I think it is time for me to clarify our position, and to explain the reasons why we believe that specific measures, debt restructuring, and financing must now be discussed contemporaneously. In particular, a clarification is needed to clear unfounded allegations that the IMF is being inflexible, calling for unnecessary new fiscal measures and — as a result — causing a delay in the negotiations and the disbursement of urgently needed funds. First, together with the other institutions we have negotiated in good faith with our Greek partners on a package of fiscal measures yielding 2.5 percent of GDP — close to being agreed — that will in our view be sufficient to reach a primary surplus of 1.5 percent of GDP by 2018. Our assessment is based on realistic assumptions informed by Greece’s track record, the international environment, and the latest data by Eurostat. decided to hold Greece to this target, we could support an additional effort to temporarily reach this level, although it is higher than what we consider economically and socially sustainable in the long-run (see below). However, let there be no doubt that meeting this higher target would not only be very difficult to reach, but possibly counterproductive. Greece’s fiscal adjustment has in the past fallen short of what was needed because of the lack of structural reforms underlying the adjustment effort. We do not believe that it will be possible to reach a 3.5 percent of GDP primary surplus by relying on hiking already high taxes levied on a narrow base, cutting excessively discretionary spending, and counting on one-off measures as has been proposed in recent weeks. The additional adjustment effort of 2 percent of GDP would only be credible if based on long overdue public sector reforms, notably of the pension and tax systems. Unfortunately, the contingency mechanism that Greece is proposing does not include such reforms. Instead, the authorities have offered to make short-term across-the-board cuts in discretionary spending — which has already been compressed to the point where the provision of public services is severely compromised — or transitory cuts in pension and wages not supported by fundamental parametric reforms. Based on past performance, such ad-hoc measures are not very credible, but they are also undesirable as they add to uncertainty and fail to resolve the underlying imbalances. I should also add that Greece has legislated a dozen contingency-type mechanisms in the past that have largely not worked. Third, going forward, we do not expect Greece to be able to sustain a primary surplus of 3.5 percent of GDP for decades to come. Only a few European countries have managed to do so, carried by a strong social consensus that is not in evidence in Athens. It would be unrealistic to expect future governments to resist pressures to relax fiscal policy over political cycles stretching far into the future. The recent experience — when first a center-right and then a center-left government quickly succumbed to easing pressures once a small primary surplus was achieved — should inform us against making such exceptional assumptions in the case of Greece. In our view, maintaining a primary surplus of 1.5 percent of GDP over the foreseeable future may be achievable in the context of a successful program and strong European budget surveillance for many years to come thereafter. I understand the urgency of the situation in the case of Greece and Europe as a whole, and our common objective is to quickly agree on a way forward. This requires compromises from all sides, and we have contributed our part by focusing conditionality on what we see as the absolute minimum, leaving important structural reforms to a later stage. 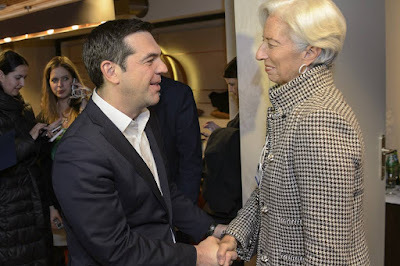 However, for us to support Greece with a new IMF arrangement, it is essential that the financing and debt relief from Greece’s European partners are based on fiscal targets that are realistic because they are supported by credible measures to reach them. We insist on such assurances in all our programs, and we cannot deviate from this basic principle in the case of Greece. The IMF must apply the same standards to Greece as to other members of our institution. Αναρτήθηκε από ΜΑΝΩΛΗΣ ΑΝ. ΤΣΑΛΙΚΙΔΗΣ στις 5:10 μ.μ.